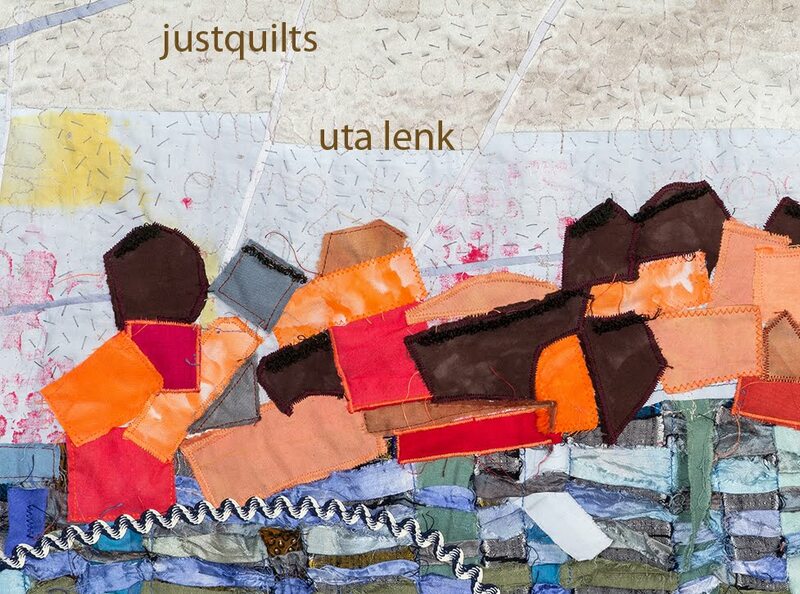 Uta Lenk - justquilts: Leaving it all behind...? Yesterday I saw a report in the paper on a 35-yr-old woman who is getting ready to set off for a bike trip to New Zealand. That’s right: a bike trip TO New Zealand. She has sold all her belongings, is taking only a tent, bike tools and a few clothes, as much as will fit into a set of bike carry-alls, and is planning to cycle to New Zealand. From Munich. Her planned route is here: http://onayellowbike.com/route-2/. She will be leaving on September 1. I admire her guts. I’m not sure I would like to cycle through Iran these days, a single woman. But then, come to think of it – is there any safer route right now – through Syria and Israel? Or down the African coast where all those vicious viruses are appearing? The heart of Africa?... She will be writing about her tour, which is also a charity event, on her website. Apparently, her reports will be in German. 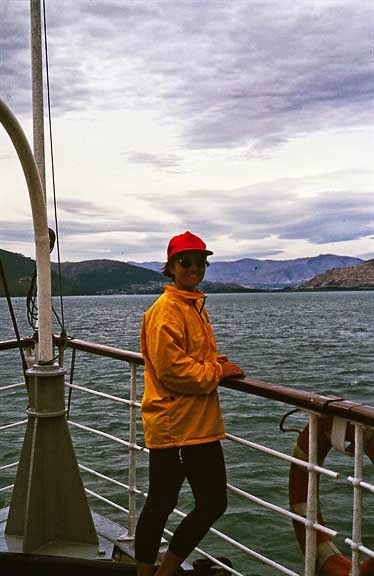 This story reminded me of Sandy Robson, the woman who is kayaking from Ulm in Germany to Australia, and whom I hadn’t checked up on in a while. She is still at it, you can read her blog here, fighting floods in India right now. I love things like that. And doesn’t everybody wish, every once in a while, that one were in another place, another kind of life than the one right now? 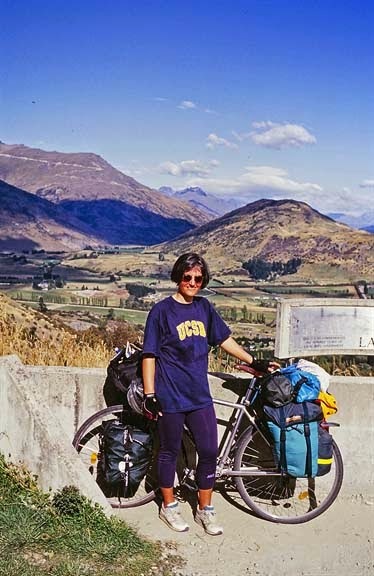 My biggest adventure in that direction of ‘leaving it all behind and going somewhere else’ was cycling through New Zealand entirely on my own, for two months, after I had finished my Ph.D. But even though I was at a difficult junction at that point, after the break-up of a relationship and not really knowing what I wanted to do with the rest of my life, I had not given up everything at home, it was ‘just’ an extended vacation. In the first picture I was on the boat to Queenstown, after I had arrived at the sheep station from the backside through the wilderness (unpaved roads) and was approached by three elderly ladies taking an outing who admired what I was doing, wished they had done something like that when they had been younger - I think, it was even one of them who took my picture. Sometimes I like to think that had I not met my husband when I finally did at the advanced age of almost 36 I might have packed up and gone to NZ, due to my increasing unhappiness with my job at the university back then. 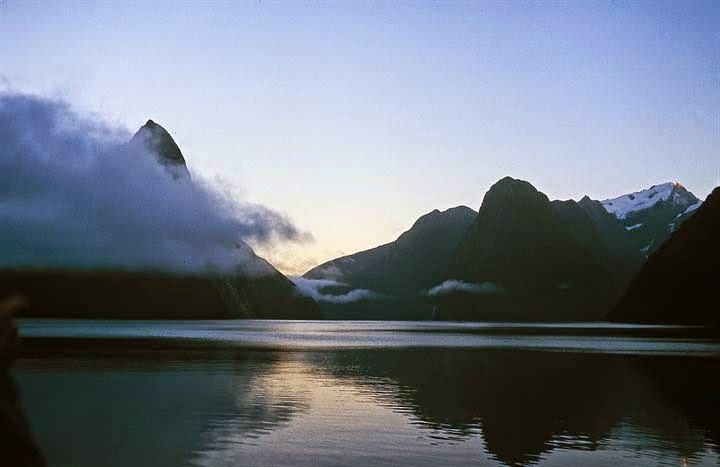 But I had bought a grand piano even before I met my husband –that’s not something you just pack up and go to NZ with, on the other hand I don’t think I could easily have parted with it again relatively quickly after I got it. So probably this would not have happened, even if I had not met my husband, and all these musings are futile – what would life be like now if I had not done this and that back then? However, these thoughts do reappear every once in a while. And it may happen while quilting... I’m still struggling with those two geometric pieces I wrote about earlier this week. I thought writing about it and publishing it on the blog would have a bit of the effect that Tom Sayer makes use of – when a wall is too high for you, throw a cap over it, and you will have to get over that wall to retrieve that cap, or you’ll be in trouble with Aunt Polly. But writing about my struggles with the quilting in these pieces hasn’t made it easier. Pretty soon after I had started I realized that the idea was less than brilliant in many aspects. First, it doesn’t take less time than sinking zillions of threads. 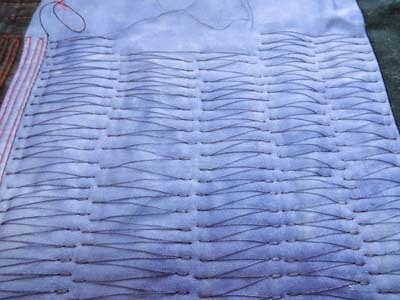 It is a rather lengthy and only moderately relaxing/meditative mode of quilting. Second, I have to be very careful so the drawn threads don’t pull the quilt together – but I am using my brand new embroidery frame for that, and so far it looks ok. Thirdly I will probably go over the inbetween parts of the drawn threads afterwards, to minimize the outside dangers. Too many things could get caught in them. But by the time I realized it all, I had already done more than made it possible to take even that little bit out and start another option. I woul d have had to discard the whole piece. I still may have to do that, who knows. But I won’t find out until it’s done. Yeah, such a great way to spend one’s time! Now if I had been in New Zealand in the first place...? I met my husband on a summer trip to England (when I had applied to Ireland but the programme for Ireland was suspended that year, so they changed the placement) and then after writing back and forth for 6 years, we married and I have been in England longer than I was ever in America. Not grand pianos, but I still have never been to Ireland! Have fun with your stitching. Sandy - isn't it amazing, although Ireland doesn't seem sooo far away from England... I have been living in Bavaria for longer than any other place in Germany now, and while I was studying in Freiburg, thought ' now that is definitely one of the federal states I never want to live in..."
I often wonder where life would have taken me had I made different choices along the way but like to think that there are many more choices still ahead. Good luck with the piece. I like the effect that the stitching is creating.